The suite comprised a 2,847 sq ft refurbished office suite located on the second floor of this prominent office building and was acquired by a long-established firm of engineers. 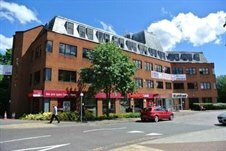 The entire first floor comprising 4,568 sq ft is now available To Let with 6 car spaces. This suite will also be refurbished to include comfort cooling. Hanover House is well positioned immediately opposite Norbiton mainline station, the approximate journey time to London Waterloo being 25 minutes.